This is always fun. 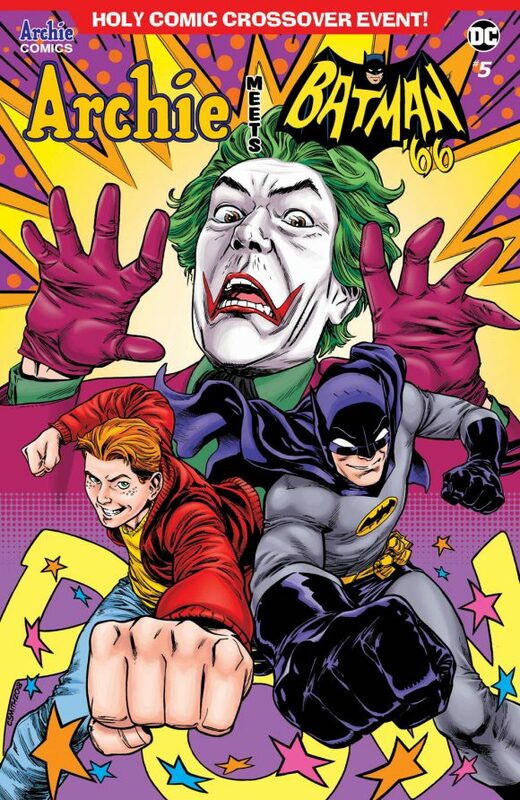 We’ve been unveiling each cover for Archie Meets Batman ’66 #5, and now we’re up to the last one. By the way, have you seen the others? Just click the names for the covers we’ve already shown off: Mike Allred, Laura Braga, Bill Galvan, Jamal Igle, Pat and Tim Kennedy. Archie Meets Batman ’66 #5 — by Jeff Parker, Michael Moreci, Dan Parent, J. Bone, Kelly Fitzpatrick and Jack Morelli — is due 12/5. And don’t forget — Adam West’s birthday is Wednesday (9/19). Check back for the special Bat-festivities here at 13th Dimension. Archie and Batman make for a different type of Dynamic Duo. Yes, David, you’re right! Very Filmationish! And thanks for the kind words! Man that’s an awesome cover! The others ain’t no slackers neither!